Bennett V351HPU1 Hydraulic Power Unit Trim Tab Pump 24 Volt. Bennett V351HPU1 Hydraulic Power Unit. A compact powerhouse that creates hydraulic pressure to lower and raise the trim tabs. It employs two solenoid valves to direct the flow of fluid to the actuators. The solenoid valves lock tightly to secure the tabs in place. Strength to lower and hold even the largest tabs in place. Lexan cover protects electrohydraulic unit from occasional wash down and translucent reservoir allows fluid check at a glance. Measures 4" x 7 1/2" x 5 1/2. 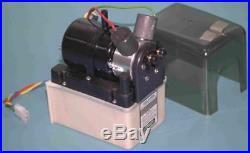 Includes pump, solenoid valves, reservoir and cover. Any other means of Communication will not be read. The item "Bennett V351HPU1 Hydraulic Power Unit Trim Tab Pump 24 Volt 2914" is in sale since Tuesday, February 13, 2018. This item is in the category "eBay Motors\Parts & Accessories\Boat Parts\Outboard Engines & Components\Other". The seller is "nuway57" and is located in 29202. This item can be shipped worldwide.